An infusion of (water, hibiscus flowers, natural tropical flavors, citric acid, licorice root, orange peel, cinnamon, rose hips, lemongrass, fruit juic extract (color), cane sugar, natural flavor, citric acid. 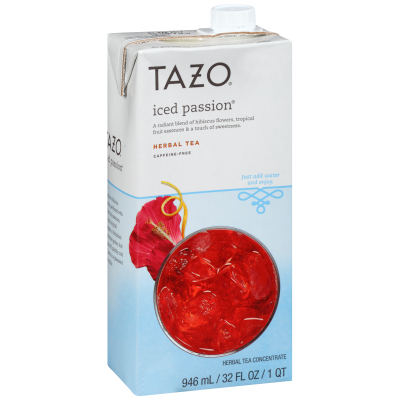 With its exuberant blend of herbal, floral, and fruit flavors, Tazo Passion Iced Tea Concentrate creates a uniquely delicious beverage that will excite even your most adventurous guests. This slightly sweet herbal tea concentrate offers perfect pucker for tart lovers thanks to vibrant hibiscus, citrusy orange peel, tart rose hips, zingy lemongrass, and a punch of warm cinnamon. The premium tropical tea concentrate also allows you to easily expand your beverage offerings to include creative drinks like iced tea lattes, lemonade-and-tea coolers, tea cocktails, spritzers, and more. Whether you're an office manager looking to ignite the creativity of your workforce, or a café owner in search of a deliciously unique flavor offering, you will love serving this beverage that inspires joy and wonder with every sip. Shake the carton and mix one part of concentrate with one part cold water. Serve individual beverages over ice.